Pizza ovens are traditionally large, brick-built appliances which take a lot of space up in your garden and the user can’t move. There are now pizza ovens available which are similar to barbecues in the fact that they are transportable, freestanding appliances. In fact, many can also be used as barbecues or to cook traditional Italian ‘al Forno’ dishes, bread and roast meats. They are an added luxury to gardens and outdoor spaces, but if you want to recreate the authentic crispy pizzas commonly found in restaurants in the comfort of your own home, you will probably wonder how you ever did without it. The newest model in the Uuni portable range, this model reaches the maximum temperature of 500°C in 10 minutes. What is new with the Uuni 3? You have an insulated body to retain heat for longer and a new grate and hopper for better temperature control and more even consistent cooking. The new chimney clip makes it even easier to pack up and take with you, whether it be to the park, beach or a friend’s barbecue. There are also three folding legs as opposed to four to make it more stable on whatever surface you choose. It is incredibly versatile and can be used to cook so much more than wood-fired pizzas. You can make prawns, steak, fish, vegetables and bread in a short time, and pizzas can be ready in around 60 seconds. The pellet burner sits at the back of the oven for easy access at all times, and no heat loss. With a modern brushed stainless-steel design which ages and weathers with use, the Uuni 3 will never look out of place in any garden. You can purchase a cover for the oven if you would like to keep it out at all times for easy access. The cover also turns into a handy carry bag for when you are on the move. For extra safety, the handles are wooden so will be cool to touch at all times. The legs also do not get hot, so can be placed on any surface without the fear of scorching the table. The Uuni 3 comes with a pizza peel as standard, so you’re pretty much ready to go straight away. 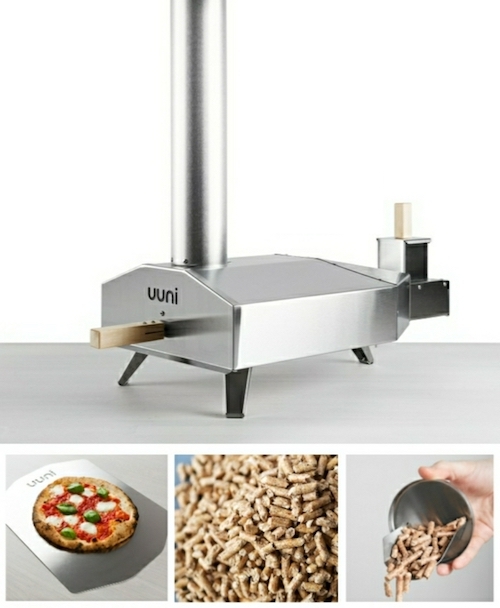 Designed to be used with biomass wood pellets, Uuni has also made a gas burner system available from the start of 2018 which the 3 model is compatible with. Handy tips: Join the dedicated Uuni Facebook group and follow the Instagram page for some great tried and tested recipes for absolutely free. Do purchase a thermometer for accurate temperature monitoring, too. Wood pellets aren’t readily available in the UK – the gas burner system may become a necessary purchase. Uuni have received critical acclaim in recent years with their pizza ovens, and this portable offering is the best you can buy by far. Big enough to cook a 12” pizza yet slight enough to pop in the car boot and take anywhere with you, this Igneus model will have your pizza base ready in 60-80 seconds. To assemble, you simply slot the chimney into the collar of the oven. Insert the firebrick (small offcuts of kiln-dried/seasoned silver birch), and you are ready to go as soon as it hits the optimum 450°C temperature. The legs are fixed to the oven, unlike with other portable models, so you don’t have to worry about losing any parts or wasting time fitting them before you get going. There is a pizza peel and embers rake included with the purchase, so you don’t need to worry about forking out for all the necessary extras. Pizza ovens usually do a lot more than their name suggests, and the Minimo is no different. Simply use a suitable roasting tin to cook meats and vegetables – ideal for preparing a Sunday roast if the weather is nice and you don’t want to slave over an indoor oven in the heat. A full chicken can be ready in 45 minutes, and roast potatoes come out crispy on the outside yet wonderfully fluffy on the inside. Portable pizza ovens are perfect for trips to the seaside, camping holidays or those with caravans and motorhomes. The adaptability of the Minimo will ensure you aren’t stuck for dinner options either. Lasagne one night and casserole the next, followed by apple crumble? Not a problem. For a portable model which requires very little assembly, the Igneus Minimo is a wonderful, versatile option. Fully insulated with a powder coated aluminium canopy, the Bambino by Igneus will add a real boost of colour to your outdoor space. Taking only 10-15 minutes to heat up to 400°C, you won’t have to wait too long to make your wood-fired pizza even if it a spontaneous dinnertime decision. To assemble the oven, you simply attach the chimney and add the firebricks. If transporting the appliance, this can be carried inside the cooking chamber, so you won’t risk losing or damaging it. The user can also adapt it for use with a large baking tray or roasting tin for the preparation of roasted meat, potatoes, vegetables, lasagnes or any other ‘al Forno’ meal. A built-in thermometer makes checking the temperature of the oven easy, no matter what food you are cooking. Perfect if you are planning to take it on a trip but don’t want to risk forgetting a thermometer. There are no accessories included with the purchase, but we recommend purchasing a pizza peel and rake. There is also a specially designed cover available if you want to keep it outside in inclement weather. If you love the sound of the Uuni 3 but want something a bit more ‘permanent’ and substantial, the Pro is the bigger cousin. One thing that puts it slightly ahead is the versatility of fuel types. You can use either wood kindling or charcoal, and a good tip is to use the latter to get the fire going and get it up to the ideal temperature quicker, and then add wood for the authentic smoky flavouring. The Pro is also fully compatible with Uuni’s new gas burner if you would like even more fuel options. The large 45 x 45 cm cooking area will prepare 16” pizzas in around 60 seconds, but you can also cook steaks, vegetables and fish, making it fully adaptable to your needs. The Uuni Pro has two doors, with one having a built-in thermometer and viewing window so you can check the progress with no trouble. The other is a letterbox-style opening so you can slide your pizzas in and out with ease. Both doors are removable if you are cooking a large piece of meat or bread. You will need to purchase the pellet or gas burners if this is your preferred fuel, as well as the 16” pizza peel. There are other accessories readily available too, such as the Uuni Pro cover, sizzler pan and casserole dish. If you would like to keep it outside all year round, the product comes with a security loop, so it can be fastened to more substantial, immovable furniture for peace of mind. Not only does it cook pizzas, but it can also do everything your barbecue can – the Uuni Pro will be your favourite cooking appliance for as long as the weather allows. A stylish and versatile option for your garden, this La Hacienda model can be used as a pizza oven, barbecue or smoker, so it is all you’ll ever need. You achieve the smoking from the dampers, which gives whatever you are cooking the perfect smoky taste which can only be gained from outdoor cooking or barbecuing. The built-in thermometer allows you to check your oven is a suitable temperature to cook your food thoroughly. Pizzas can be ready in around one to three minutes, so even if there are quite a few to prepare you won’t be waiting for long at all. Keeping it clean is no hassle – the ash box comes out completely for easy emptying, and both the pizza stone and racks are dishwasher safe. Made from durable steel, this pizza oven will be long lasting even with constant use. There is a cover available which will keep it safe from the weather all year round. The design is traditional, so will look flawless in any garden. We recommend using briquettes rather than charcoal pieces, as the temperature will increase quicker and will hold for longer. For the price, this pizza oven is packed full of handy features to make your pizza baking a much simpler task. There is an in-built temperature gauge, a separate door for your charcoal fuel and an adjustable valve to effectively regulate temperature and flames. The viewing window also allows you to check on the progress of your pizza without opening the door and losing any heat. Although it’s too large to take with you on a trip away from home, this model is still quite transportable thanks to the added wheels on the stand base so that you can chase the sun around the garden in between pizza baking. There are also two additional shelves for storage, so while one pizza is getting ready you can prepare the next to go in straight away. Constructed from steel, it is durable and robust so can’t be easily damaged from frequent use or outside elements. An affordable outdoor appliance if you are after a simple pizza oven without any fuss or fiddly extra features. If you want a portable pizza oven which also acts as a colourful centrepiece for the garden, the Firepod is a really great retro-style choice. Available in aubergine, red, blue and black, it can easily be moved around so you can take it on holiday or to the local park with ease. It also works with bottled gas, which not only makes transportation more manageable but also makes the running clean, efficient and cost-effective. The perfect pizza cooking temperature (600°F) is reached in only 10 minutes, with a regular sized pizza ready in about 3 minutes. Oak handles make the pizza oven easy to carry even when it is still hot as they won’t be affected by temperature. They also make it easy to take the top off the oven to convert it into a barbecue. An oak cap on the lid will also keep any elements out if you choose to store it outside. The auto-ignition and gas control knob make operating the fuelling easy, and there is a dual layer pizza stone to prevent the pizza base burning. Stainless steel rails will also keep the pizzas in place when cooking. There is an optional griddle available at an extra cost, so you can use the oven as a barbecue to prepare meats and vegetables. You can also make pancakes, bacon and eggs on the lava stone for an outdoor breakfast. The Firepod is easily the only cooking appliance you’ll ever have to take with you when camping, heading to a festival or going for a picnic. If the external look is just as important as the cooking results, this retro model is the only suitable option for your outdoor area. Which Is The Best Pizza Oven For Me? Despite them all essentially doing the same job, every pizza oven on the market varies slightly from its competitors. Think about whether you want only to use it for the preparation of pizzas, or whether you would like it to act as a barbecue or traditional oven as well. You also have to consider the fuel type and ensure this is readily available for you, as well as whether you would like to take the pizza oven anywhere (such as camping or to a friend’s house every so often). In the form of briquettes or rocks. They get a lot hotter than other forms of fuel, so are good for getting up to temperature. It is best to use wood later to maintain the heat or add flavouring. The most common option. Commonly in the form of kindling, pellets or silver birch logs. Offers the best tasting, traditional pizza with a smoky flavour. Requires gas bottles. Generally, more readily available and easier to transport. They do take longer to heat though, so constant temperature monitoring is essential. While pizza ovens cook their contents quickly, you must ensure it heats up to the optimum temperature before you start to use it. This can take a while but is needed for even heat distribution. Always keep an eye on the temperature during cooking. If it starts to drop, you may need to add more fuel. Many pizza ovens currently on the market are portable, as they have a separate cooking chamber and stand. This allows you to take it with you if you go on holiday, for a day at the beach or want to use it while caravanning or camping. A lot of these portable models also double up as barbecues, meaning you are very flexible with what you can cook each night. There could also be the possibility to cook things like eggs and bacon on the pizza stone or griddle, so you aren’t limited to cereal for breakfast. Most can be set on almost any surface, whether it be a table, concrete or grass. Don’t worry if you’d prefer to use your portable pizza oven with a stand if in the back garden – most models have separate stands available, as well as covers for storage. What Is The Ideal Temperature To Bake A Pizza? 485°C is commonly the best temperature to bake a fresh wood-fired pizza. You should also cook it for no longer than a minute and a half. All of the pizza ovens we have featured will reach a temperature of at least 500°C. What Tools Do I Need To Buy? You will likely need a pizza peel and an ember rake to ensure an even and perfectly prepared surface. You may also need a pizza stone. Optional extras include covers for when the oven isn’t in use, a carry bag if it is transportable, and any extra baking dishes or grills if you would like to use your appliance as a traditional oven or barbecue occasionally. Not all ovens come with any additional extras, so it is worth researching into what is available and how much these items will be in addition to the cost of your basic oven. Can I Use My Pizza Oven Indoors? It isn’t recommended due to the smoke produced and high temperatures required. However, gas ovens do not generally produce smoke so could be suited to a more enclosed area such as under an awning or tent, if you won’t be using wood during the cooking process. There are also electrical pizza ovens available, but many argue they don’t produce the authentic wood-fired taste which a dedicated pizza oven should offer. Which Companies Make The Best Pizza Ovens? Uuni and Igneus are our top picks, and continuously top lists of the best pizza ovens available. They offer models of different sizes and for different requirements, such as portability and fuel type.